I was delighted to find out that we had been chosen as a Maxi-Cosi Reporter. We would be testing out the new Loola in Graphic Crystal. In the 17months I’ve had Jack I’ve become a bit of a pushchair addict so I was looking forward to see how the Loola compared. Being a Maxi-Cosi Reporter we will be set four tasks to complete to show you the ins-and-outs of the all new Loola. Our first task was to unpack and put together the Loola and show you all the features. On receiving my Loola, I didn’t expect it to be a very sturdy or wide pushchair, it was in a small square box – but let me ensure you it was just well packaged. As I opened the box I caught a quick glimpse of the silver and it was so much better than I expected and it complemented the black. The instructions in which you get with the Loola are not particularly clear and helpful although with a little common sense you can make manage. One thing I love about the Loola, is the chassis is free-standing when folded, making it easier for storage. After figuring out how to unfold the frame it was pretty simple; you simply lift two white buttons on the top of the frame and out it folds. You then need to push down the black pedal at the lower centre of the frame ensuring it clicks. This then locks the frame in place making it secure. Next we attached the seat unit which you can have both parent and world facing. Now at first this proved a little difficult however, it’s quite simple. You simply need to fully stretch the seat unit out and then line up and click the unit in. There is a slot either side which the seat fits into. Next we needed to attach the hood and bumper bar, these were really simple to do. On the seat unit there are two small holes in which you place the hood into. You then clip the buttons over the frame and you can also zip it down the side of the seat unit to keep it in place. Again, the bar simply has two little clips which you just click in place on the front of the seat unit, once you hear the click that is in position. Adjusting the shoulder straps was again easy to do and once you have made them higher adjusting them for the right fit is also easy. The Loola has many different features, the one in which I like the best is the double aspect hood. Along the hood there is a zip in which you can leave as an average sized hood or you can unzip to make the hood a lot larger. With the sunny weather we have had recently I have found this really useful in keeping J shaded. The hood also has a little window section which still allows some light in, but also allows you to look in when world facing and your baby to look out at what is happening. The Loola also has a fully reclining seat unit, which for added benefit can even be done with one hand! J had one short go at being reclined and he did look very comfortable. I also like that the whole of the seat unit reclines and not just the back rest as this then ensures your child stays comfortable. Underneath the Loola is a really large basket, this was yet another favourite part of mine. I have never had a pushchair wish a basket as large and deep as the Loola’s. The basket itself is very large and deep and enables you to place a large amount inside, so perfect for parents who walk to go to the stores as you have a lot of room to store. I placed the rain cover in there and there was still so much room. In addition to the large basket there are two small clips on the handle bar which enable you to attach your changing bag, however when I quickly nipped over to the store I attached my shopping bag. The rain cover to the Loola is large and easy to attach, it also has air holes either side to help prevent the cover steaming up. We also received a clip to attach a parasol which you simply place in the side of the frame, either side and then attach the parasol too. In addition we received car seat adaptor clips and a baby nest. I placed the baby nest into the Loola and it fitted snugly and looked lovely. Unfortunately Jack is far too big for this now, which does make me sad. However it would be prefect for new-borns. You simply just place the harness through as you would on a footmuff and this helps to secure it in place. I found folding the Loola very simple, simply just fold the handle down, lift the black bar at the bottom and then lift the little white buttons as you do for unfolding. You just fold the chassis until it clicks, you then know its locked in place. Another fantastic thing is you can fold the Loola with the seat unit attached in either parent or world facing mode. I find it fantastic that the Loola folds up so small for such a large multi-purpose travel system. So, my first impressions with the Loola, I’m very impressed. 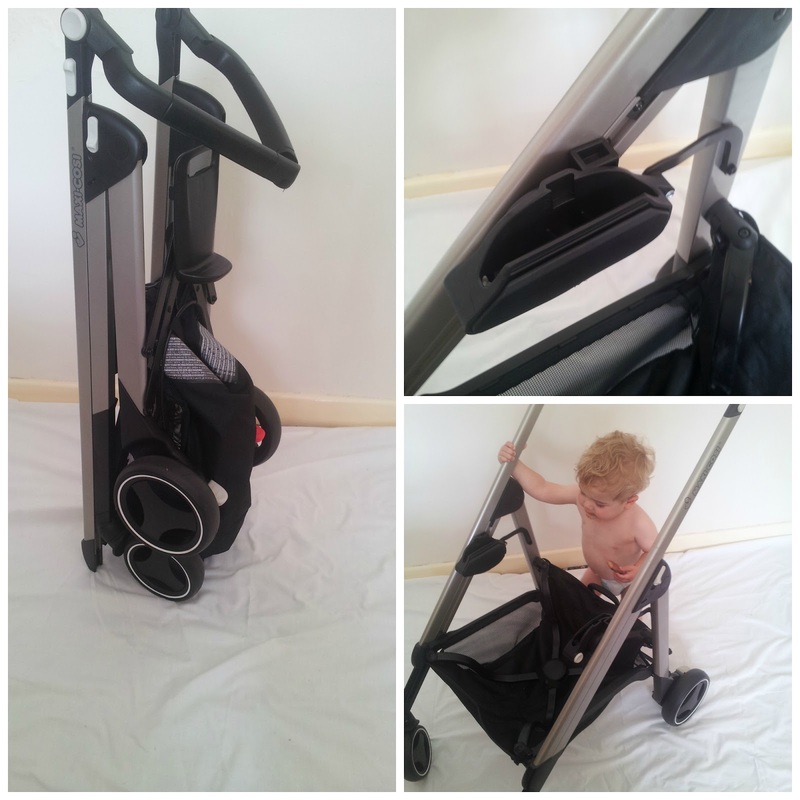 It’s very different from the pushchair I have currently been using, but for so many good reasons. I am really enjoying using the Loola, and my partner and mother are also impressed with the adjustable handle height and manoeuvrability. I’m excited to be testing the Loola and sharing my experiences with you.